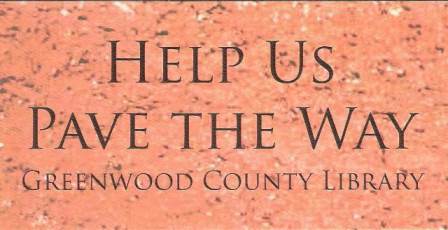 You can play a vital role in Greenwood's future by participating in the Buy A Brick Campaign for the County Library. The purchase of your personalized brick will show you care about the educational opportunities the Library offers Greenwood County. Bricks can be purchased as a memorial to loved ones or to mark special occasions such as births, weddings, and anniversaries. What better gift for the people in your life who have everything than an investment in the future of their community. Buy a 4"x8" brick for $150 each. You may have up to three lines with 20 characters per line. Each space, comma, period, or other such punctuation is counted as a character. For more information, please contact the Library at 941 - 4650.